Our Sunday morning services last for about an hour and include a mixture of traditional and modern worship songs. They invariably include singing, prayer, Bible reading, an all-age slot and a sermon or talk. Video clips, responsive readings and 'audience' participation are frequently involved! We welcome young people of all ages. A creche facility is available for pre-school children of both members and visitors. Provision is also made for school age children offering a mix of activities. During the holiday periods activity sheets are provided for use during the service. Communion is included in the service twice a month (usually on the first and third Sundays) and is open to all who love Jesus. The last Sunday of each month is designed to be accessible to all ages and stages and is less formal. When the last Sunday is a fifth Sunday the service starts with refreshments. 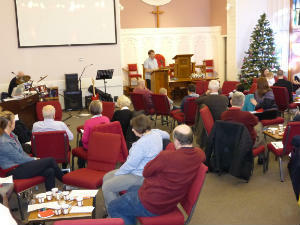 The chairs in the Church are arranged around coffee tables to enable conversation before, during and after the service.